More Human Than Human comes along at a time when perhaps no reminder is necessary: leaving life to bots—whether that means machine learning, artificial intelligence, genuine human-like androids, etc.—might get messy for us humans. Westworld gives us one version of a sentient-machine uprising every Sunday, and news cycles like those involving Cambridge Analytica and Facebook provide gentler reminders that creating increasingly intelligent tech platforms can lead to unwanted manipulation and consequences right now. That’s a central question driving More Human Than Human throughout this fairly tight (roughly an hour and 20 minutes) documentary. In fact, the film packs in so many interesting AI applications—from the high-profile to the genuinely unexpected—that at times it leaves you wanting more time or reflection with certain examples. But More Human Than Human still works as its filmmakers intended even as an accelerated, macro-level catch-up on the state of artificial intelligence. Viewers will be hard-pressed to watch and not take a second look at everything, from their voice assistants to their sci-fi. Ars chatted briefly with filmmakers Tommy Pallotta and Femke Wolting at SXSW 2018. Here’s the film’s trailer. More Human neither says the end is near nor that we should all become cyborgs. For every interviewee who says “Internest” (because we’re incubating evil) and for every chatbot good enough to catfish a Loebner prize judge, the film also finds small androids providing comfort to the elderly or children with social disorders who find a way to communicate through Siri. And with each portrayal presented, no matter what the easy audience assumption may be, shades of gray emerge. Pallotta and Wolting don’t only fill their film with the most cutting-edge humanoid creations, either. Yes, the doc contains brief passages on autonomous cars, manufacturing bots, or the latest in high-tech prosthetics. But even if you tend to read (and/or write and edit) about advancements in robotics and artificial intelligence daily, More Human will likely show you something surprising. AI artists may not be Picasso, but they paint better than most of us; the same can’t be said for AI actors just yet (the creators behind that seem smart, though—they recognized it as the easiest job with the best pay rate). Elsewhere, bike couriers get dispatched through AI management, and the latest in post-death chatbots help those grieving. But perhaps the film’s most clever way to humanize this fairly heady, abstract, and vast topic comes from Pallotta’s and Wolting’s personal AI experience. Since the two are documentary filmmakers, they decide to test how their niche world will get increasingly impacted by artificial intelligence. Netflix, Amazon, Apple, and other tech companies already kinda-sorta affect their livelihood through various algorithms promoting and recommending work for purchase or rental. But while partnering with the famed Carnegie Mellon robotics program, the two stumble across something much more futuristic: CameraBot, an AI-powered interviewer. 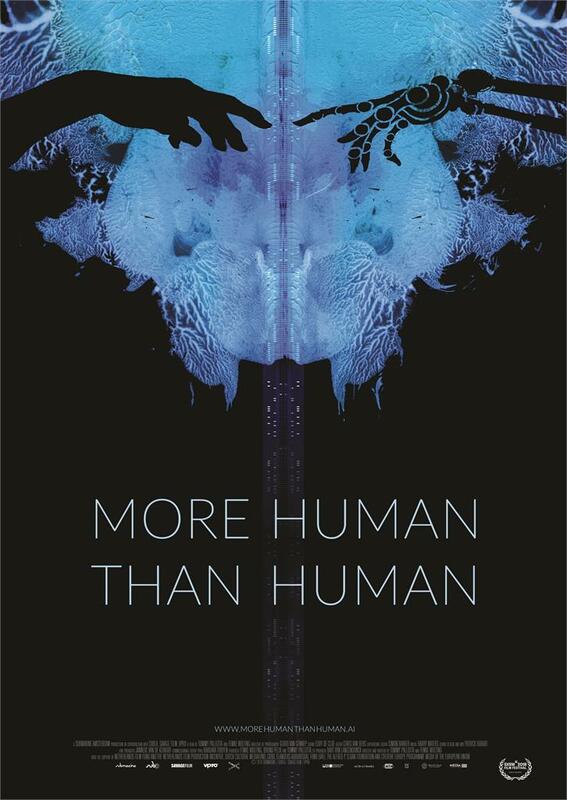 Enlarge / The poster for More Human Than Human. Pallotta and Wolting put this robo-Reitman through its paces in various ways throughout More Human: letting it interact with experts and actors, calling in the likes of fellow filmmaker Richard Linklater to evaluate the situation, and even sitting down for a one-on-one final interview. While early film evaluators find value in a bot that chooses unusual camera angles and generates unexpected questions, those interactions tend to happen in rooms full of people where CameraBot can work with lots of new information. When Pallotta himself goes solo with it, the results get much odder, almost like an atmospheric horror flick. CameraBot moves without warning, cuts off Pallotta’s answers if he pauses to ponder the question a bit more, and fires off some creepy, seemingly out-of-nowhere inquiries. Who are you? Do you hate your enemy? Making a film about AI seems like a daunting task. Information-wise, the real big players—your Google, Facebook, Amazon-type of combo development-and-application houses—don’t want to talk about how the sausage is made or what it’s really for. They merely want us to eat it and in turn feed the process further. Visually, things can also get incredibly repetitive, depicting nothing but folks sitting at computers or Hollywood-like androids again and again. And ultimately, it’d be easy for the filmmakers to fall into fire and brimstone or pom-poms and confetti type of rhetoric. But today’s AI reality has much more nuance—yes, some incredibly futuristic things have been done that benefit society greatly, but artificial intelligence has also been a tool that subtly manipulates or only increases the information and wealth gaps (whether intentionally or not). Where the technology goes next depends not only on capability but also will proceed based on what our collective awareness is and how we think about what a good versus bad application may be. Maybe something in the news cycle can occasionally lead to such reflection, some bonkers story causing us to pause and consider the big picture even briefly. But a film like More Human Than Human can nudge such moments on-demand, making it worth a stream or a ticket at some point down the line. More Human Than Human will show three times at Toronto’s Hot Docs Festival: Tuesday, May 1; Thursday, May 3; and Saturday, May 5. The film will likely continue to play the festival circuit from there, so look for upcoming screenings (or down-the-line distribution information) on the official website.